File Name: Kyle A. Jesso of Sacramento, California. Notes: Sacramento is the state's capital, near the center of the state, about 90 miles northeast of San Francisco. Budo was animated only for commercials. Accessories: silver sai with S-shaped cross-guard and ring behind grip (new), red sword with long ribbed grip and straight cross-guard (new), silver sword in curved scabbard with ring to hang on belt (new), silver Samurai helmet with red top and silver crest (new), brown backpack with engraved grenades on top and weapons clips on sides. "The man has a fifth-degree black belt in Iaido (the art of the live blade), and similar rank in three other martial arts. He could have even higher rankings if he didn't spend so much time working on his chopped, pan-headed Harley and listening to heavy metal." Accessories: silver scabbard sword (88 Budo's), orange helmet with blue top and silver crest (88 Budo's), black figure stand (common). There comes a time when the power of evil becomes so threatening to world peace that global leaders must join together to stop its impending danger; Cobra is just such an evil. An international force of G. I. Joe combat specialists have been called upon to hit Cobra and hit them hard! Russia is represented by BIG BEAR, an anti-armor specialist who loves to blow up Cobra tanks. From England comes BIG BEN, an expert in subversive operations and enemy infiltration. Japan has sent BUDO, one of its greatest samurai warriors who plans on slicing Cobra into tiny pieces of snake meat. 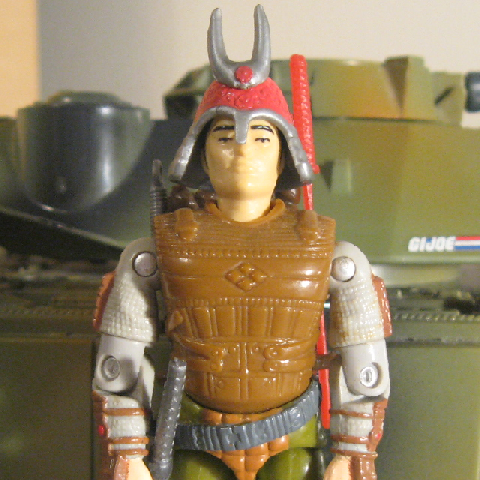 SPIRIT, a Native American also joins the team from his home in Arizona, where he was called for duty to track down and eliminate Cobra Dreadnoks. World peace must be upheld and Cobra evil must be stopped...TODAY! Toy Notes: Exclusive to the mail offer Menace in the Wilderness, along with Big Bear, Big Ben, and Spirit.